If you know me, or read this blog, you know that I have a lot of old computer parts. Some would say I have too many. Those people are idiots. I saw on the internet that you can buy these spinners that you hold in your hand and spin to keep from being bored, to improve focus, whatever. I figured it would be easy to build some of these out of old Macintosh computer hard drives in my garage. I googled it, and of course, I wasn’t the first person to think of doing this. 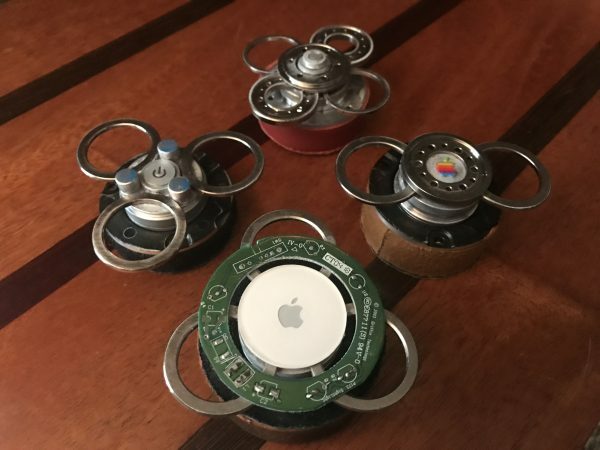 But I had a ton of old hard drives that needed their data wiped, so I decided to build some spinners, killing any data (and some time) in the process. Here’s a few examples of a 2, 3 and 4 piece spinner. These are made completely out of old Macintosh computer hard drives, some super glue, and some leather for the base. No instructions are really needed for this project. Just take apart an old hard drive and start glueing stuff together. Do they have a purpose other than to keep fidgety hands busy? No, but they are fun to spin, completely silent, and keep me from tapping on my desk and annoying everyone around me. Watch below to see the spinners in action…click the image if the animation doesn’t automatically loop. This entry was posted on Sunday, May 14th, 2017 at 10:48 pm	and is filed under Uncategorized. You can follow any responses to this entry through the RSS 2.0 feed. You can leave a response, or trackback from your own site.